For the love of a date..
On Jan 31 1606, Guy Fawkes was hanged for the gunpowder plot. On Jan 31 1797, Franz Schubert, the Austrian composer was born. On Jan 31 1865, The thirteenth Amendment to the US Constitution abolishing slavery was passed by Congress. On Jan 31 1915, Germany became the first country to engage in large scale use of poison gas in warfare. On Jan 31 1953, A North Sea flood caused over 1800 deaths in the Netherlands and over 300 in the UK. On Jan 31 1966, The Soviet Union launched its first unmanned Luna 9 spacecraft as part of the Luna program. On Jan 31 2010, Avatar became the first film to gross $2b worldwide. On Jan 31 2014, Alexander Ivashkin, the Russian-English cellist and conductor passed. 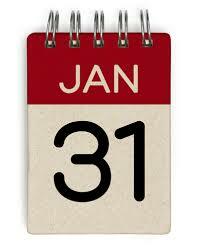 On Jan 31 2015, if you are self employed or self assessed, your UK tax return is due! Avoid the late submission penalties. Don’t get caught out. Get in touch now if you are struggling to keep up.